The highly-anticipated martial arts film Ip Man 3 <葉問3> will be fighting its ways to theaters this Christmas in Hong Kong. The movie, which brings back Donnie Yen (甄子丹) as the wing chun master Ip Man, continues Ip Man’s story in 1950’s Hong Kong and revolves around his meeting with Sum Nung (Zhang Jin 張晉), another wing chun practitioner. The upcoming movie also stars the American “boxing king” Mike Tyson in his first action film. In the movie, Mike Tyson plays a property developer who is also a skilled street fighter. He will fight fist-to-fist with Donnie’s Ip Man, and fans will get the chance to see how a western fighter and a wing chun master battle it out in the boxing ring. Mike Tyson fractured his finger when shooting their fight scene earlier this year, but Donnie himself almost got knocked out too. In a recent making-of feature released by Pegasus Motion Pictures, Donnie was seen trying to dodge Mike Tyson’s quick fists, and almost got knocked down. Donnie looked speechless afterwards. “Wow!” he said. Besides using wing chun against boxing, Ip Man will also use his practice to fight against a Muay Thai boxer (Sarut Khanwilai). 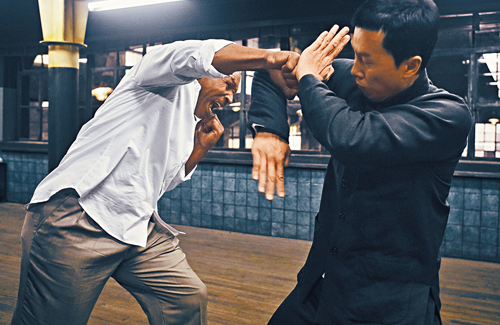 At the end of the film, Ip Man will have a historic fight against another wing chun master, Sum Nung. The latest trailer and this making of sure sells the hype. I just hope Tyson will have less dialogue scenes and more build-up on his epic fight scene(s). look at the size difference. Donnie is already very muscular for a Chinese guy. Oh Yeah! With so many Ip Man out, only Donnie’s seems to have left an impression with me. Can’t wait. Tyson was a beast but shame scandals and his poor sportsmanship messed up his boxing career. He shows a lot more humility and have become more modest these days in comparison to his youthful days. Definitely worth watching just him and Donnie Yen going at it.